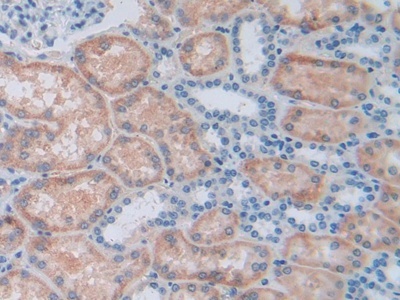 The antibody is a rabbit polyclonal antibody raised against ALDH7A1. It has been selected for its ability to recognize ALDH7A1 in immunohistochemical staining andwestern blotting. Recombinant ALDH7A1 (Met1~Gln539) expressed in E.coli. 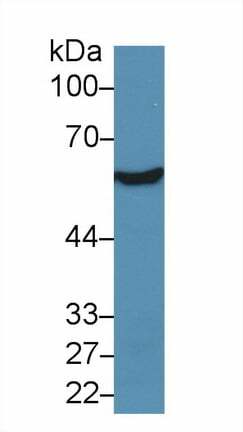 Small volumes of anti-ALDH7A1 antibody vial(s) may occasionally become entrapped in the seal of the product vial during shipment and storage. If necessary, briefly centrifuge the vial on a tabletop centrifuge to dislodge any liquid in the container`s cap. Certain products may require to ship with dry ice and additional dry ice fee may apply. NCBI/Uniprot data below describe general gene information for ALDH7A1. It may not necessarily be applicable to this product. ALDH7A1: Multifunctional enzyme mediating important protective effects. Metabolizes betaine aldehyde to betaine, an important cellular osmolyte and methyl donor. Protects cells from oxidative stress by metabolizing a number of lipid peroxidation-derived aldehydes. Involved in lysine catabolism. Defects in ALDH7A1 are the cause of pyridoxine-dependent epilepsy (PDE). PDE is characterized by a combination of various seizure types. It usually occurs in the first hours of life and is unresponsive to standard anticonvulsants, responding only to immediate administration of pyridoxine hydrochloride. Belongs to the aldehyde dehydrogenase family. 3 isoforms of the human protein are produced by alternative splicing. 1. Wild-type ALDH7A1 is shown to exist in a dimer-tetramer equilibrium with a dissociation constant of 16 muM. In contrast to the wild-type enzyme, the variants reside in monomer-dimer equilibria and are apparently incapable of forming a tetrameric species, even at high enzyme concentration.